Comfort-Pedic manufactures nearly 150 different types of mattresses to ensure the most restful sleeping experience for each of our customers. This has led us to create a manufacturing process that ensures the highest quality-control and the best on-time delivery in the industry. The quality and comfort of our products often speak for themselves. We are regularly contacted by guests, of hotels that feature our mattresses, asking to purchase the same model for their home; we are happy to oblige! Previous customers also build our reputation when they often refer friends or buy additional mattresses for the other beds in their homes! We are so confident in the design, manfucture and delivery of our products that we offer a NON-PRORATED guarantee on all mattresses we sell – to give our customers peace-of-mind along with their good nights rest. Our committment to your satisfaction last for years to come. If for any reason, your Comfort-Pedic mattress does not meet your changing needs – we’ll change it and waive all labor costs! So if your needs change, after one, two or even three years (e.g. one side firmer, one side softer, raised edging, etc.) we’ll offer you a free consultation with one of our sleep-experts who will redesign the mattress – all you’re asked to pay is materials and shipping. 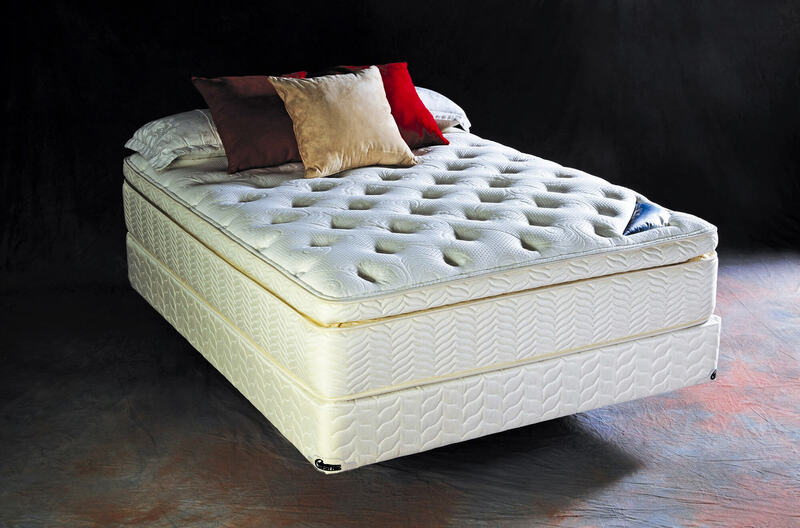 Comfort-Pedic designs deliver new levels of style and comfort with our innovative use of new materials in new ways. We continually search the world for the finest mattress materials and pricing available. The softest cottons from Egypt, the strongest silks from the Orient, the longest lasting cashmere wools, the most age-resistent natural rubber, the heaviest foams, the most durable springs, and more. We started with a clear vision nearly 30 years ago: to provide “Luxurious Comfort in Fine Bedding”. During those 3 decades we have consistently delivered on our promise to every customer with every mattress sold. Our founder (still active in the business today) began with a scientific approach to creating our design collections that continues today. We continually re-evaluate the industry trends of-the-past, examine the new products of-the-future and the satisfaction of our customers today. Highest Quality Trade Marked Foams: such as Sensus, HR foam (High Resilient), Resilitex, Reflex and Quiltflex foam, trade marked and best durable sagging free foam components in USA today. Ticking: Belgian imported damask fabrics. Luxurious Finish: Embroidered labels & handles (8 handles in King Size). Cores: HR, Reflex and 100% Natural Rubber (Latex). Non Disturbance: all the cores in the Export Division Line of Mattress are non motion transfer cores to guarantee the quietest and non disturbing sleeping surface for our clients. Edge Supports: Foam encased sides to prevent edge sagging, give more sleeping area, preventing rolling off the bed. Non Skidding: Bottom non skid stitch bond material to prevent mattress sliding over the box spring. Box Spring: Modular box spring for durability, longevity, support and to eliminate motion transfer from one side of the bed to the other (No Disturb). Corner Guards: Luxury Comfort-Pedic 2 Platinum tones corner guards for enhancing elegance & beauty looks and for protecting box spring corners. Warranty: 20 years Non Pro-rated limited warranty Policy. Non Disturbance: all the cores in the Recreation Division Line of Mattress are non motion transfer cores to guarantee the quietest and non disturbing sleeping surface for our clients. Ray is the man. He educated us and was not pushy. If you go in there with open ears and not in a hurry you will leave a mattress expert. They are a designer with no specific brand loyalty so they will expose other manufacturers cost and quality cutting tactics. We were on the hunt for a nice firm mattress over a year ago and I found the perfect place to get one!! Ray was very helpful and very nice when he gave me a huge bargain for the mattress, threw in a bed frame, and even sheets to protect the mattress from leaks! He was kind and very understanding when I also needed to budget for something else so he cut me a nice deal with the purchase. Our mattress is also still very nice and comfortable. I will reccomend this mattress location to any friend in the future and anytime! After going to this mattress store and being helped by Ray I would never go anywhere else! He taught me all about memory foam versus other types of mattresses and since he has a family member who is an orthopedic surgeon he is very knowledgeable regarding back pain. Also, I am pregnant so it is very important that I am comfortable while I sleep and Ray made sure I would be. So far I have had his product for a week and I couldn't be happier! Ray was very helpful, very kind, and he is now my official mattress guy! Excellent place to buy a high quality mattress.!! If you consider you spend 1/3 of your life in bed, then this investment is of utmost importance. I am a chiropractic physician and many of my patients are constantly asking me where to buy a quality mattress. The only place I recommend is Comfort Pedic Mattress Factory in San Marcos. Ray is very kind, attentive and informative and will educate you on the construction of mattresses and why theirs stand far above the rest. Which they do! Call or email for franchise opportunity. ©2017 Comfort-Pedic Mattress Factory, Inc. | WebsitesMakeover.com.